Yesterday I started a Training Peaks Half Marathon plan designed to get me across the finish line at the Busselton Half Ironman relay in 1:45. Well, I signed up for the plan two months ago when May seemed a long way off and I still believed in miracles! The schedule for Monday said 8km easy, so I ran 8km maybe not easy but strong, but not pushing too hard. It was one of the best training runs I had done in weeks. My Garmin watch, which is still under warranty, is out of action at the moment. I had to send the faulty charging cable to Garmin Australia in NSW for repair/replacement. So yesterday, I couldn’t actually see my pace as I ran. I was running purely by feel, recording the run using the Strava App. I felt great! My average pace turned out to be 5:10min/km. My last kilometre was sub 5mins. I guess I got a bit carried away with myself but it felt so good! When I got home I checked the training plan again and noticed for the first time that the pace indicated for the run was just under 6min/km. Not only that but this pace doesn’t increase for any of the non-interval runs throughout the 10-week plan. Surely this must be a mistake. How can you go out and run 21.1km at 5min/km pace or faster when most of your training runs are done at a minute slower per kilometre!? I dismissed the plan as lightweight. As Monday progressed, my energy levels did the opposite. I was zonked. Today’s planned interval session didn’t happen at all. It’s almost 3PM and I’m still dressed to run but the only run I’m doing soon is the school run, in a car. So as fabulous as I felt in the immediate aftermath of yesterday’s 8km, I’m not feeling somewhat deflated. Day two of a plan and I’ve already skived. Day 1 and I’ve already over-trained. So what to do? Well, buy a book of course! And finish a novel. I should slip that in too that instead of running today, I had a little nap then finished a novel I’ve been working on for three years. No one has read it yet so it could be complete tosh but at least it is completed tosh. Back to my purchase. 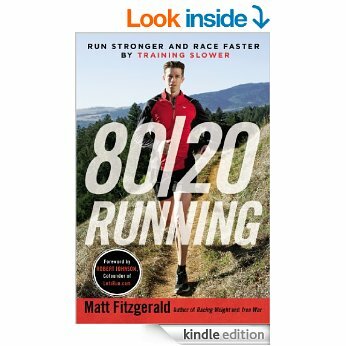 It’s called 80/20 Running: Run Stronger and Race Faster by Training Slower. Its main message is that in order to run faster, runners need to train slower. Yes, its counter-intuitive but the premise is based on scientific studies and analyses of athletic performance. I’m still sceptical but I think it’s worth a read. Certainly, the press coverage for the book has been very positive. It’s hard to run slow when you feel you can run faster. It’s also hard on the ego to deliberately run slower that you are capable of 80% of the time, then display the fact on Strava. Well it is for me! That said, my constant attempts to run every run as fast as is comfortable without pushing too hard isn’t paying dividends other than in measures of frustration as I’m not actually getting any faster. I’m feeling tired and heavy legged a lot of the time, and I am developing new aches and pains on a weekly basis. So, I’m ready to try something new, ready to slow down if it really means I’ll stay injury-free and run faster in the long run. I’ll let you know what I think of the book. I’ll let you know too how long it takes Garmin to return my cable!